The backbone of an irrigation system lies mostly underground and consists of three main components: pipes, fittings, and vertical risers. Before buying any of these, however, check your local building code to find out if you’re required to use copper pipe for the main supply line. 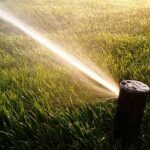 Most underground sprinkler systems use Schedule 40 polyvinyl chloride (PVC). However, use Schedule 80 pipe for the start of your system since it’s stronger and resists damage from sun exposure. 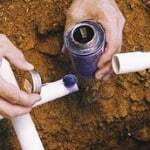 In areas where you can’t use rigid pipe, flexible PVC is an option as long as your water pressure is not too high. 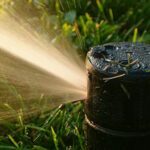 Residential systems usually use pipes that range in diameter from 3/4 inch to 1 3/4 inches—talk to a supplier to determine the best size for your water pressure and the flow rate your landscaping requires. Polyethylene pipe (PE) is sometimes used in combination with PVC to connect sprinkler heads to underground pipes because it’s flexible and doesn’t require cementing to make a connection the way flexible PVC does. However, PE doesn’t stand up to pressure as well as PVC does. PVC fittings, which can be threaded or slip-type pieces, are used to join pipes, make turns, branch water flow in several directions, or close off ends. Slip fittings attach with cement, forming strong, permanent connections. Use threaded fittings where you may need to make adjustments or replacements. Threaded fittings require exact measurements to make sure the connection is stable. PE pipe fittings are either barbed or threaded and are held together with stainless-steel clamps. 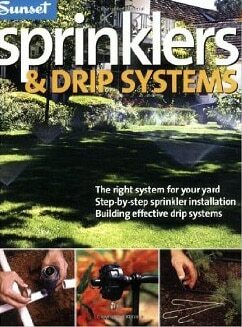 These connect sprinkler heads to the irrigation system and come in a range of options to suit your landscape needs. Precut PE risers, plastic adjustable-height risers, and swing-joint risers allow you to customize the height and angle of your sprinkler heads.